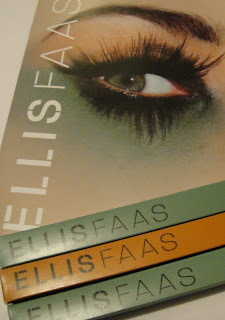 Ellis Faas – the haul! Courtesy of the lovely, lovely LondonMakeUpGirl these arrived today, and I’m delighted! 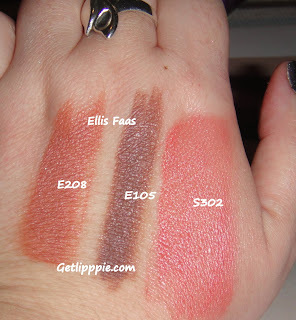 I’d ordered two eyeshadows and a blush a couple of weeks ago, and after a slight snafu with the order courtesy of the Ellis Faas online shop (which was very quickly and most courteously sorted, bless their cotton socks!) it’s taken a while for them to get here. I have to say that the picture with the flash is more true to the actual colour of the products. I do have one issue with Ellis Faas and that is that the online swatches are dreadful, these colours (beautiful though they are) aren’t quite what I was expecting from the online shop. Online they look pinker, but I suggest you hang on till you can see them in the flesh before buying – they’re launching at Liberty in February, and both Grace and I will be in line for more! I’ll bring you a FotD with these products soon, I can’t wait to use them properly! I already have two of the lipsticks, and I know they’ll both work with these colours! I like the blush. Gonna treat myself to a couple of bits when it's here in Feb methinks. I'd love to see your FOTD with these colours. The blush shade is gorgeous! I like both of those eyeshadows. Can't wait to have a proper go when the counter opens. Isn't the blush lovely? Such a nice colour, will go with most any eye/lip combo, I think. I really like the blush, but I love the eyeshadow's staying power, they're amazing! Shame the swatches on the website are so dreadful though, they're not *quite* the colours I would have liked. Still, that won't be a problem from February!